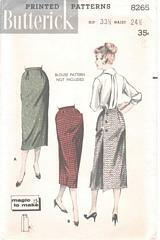 Vintage Butterick sewing pattern number 8265. Slender wrap-around skirt that buttons in the back. One pattern piece; no side seams. View A, Plain Front, takes only one yard of 54 inch width fabric. View B, Welt Pocket Version, takes 1-1/8 yards of 54 inch wide fabric. Size 24.5 inch waist; 33.5 inch hip. Pattern is uncut and in original factory folds. Overall very good condition.